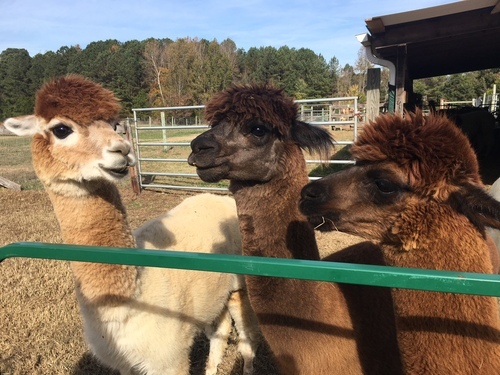 Alpaca Dreams, LLC is has Alpacas, LLamas, Gift Shop located in Louisburg, North Carolina owned by Mike and Sarah Conyer. On March 18 Mike had shoulder replacement surgery and his recovery has been going well. We were able to reopen after only being closed for a week. Then, 2 weeks after Mike's surgery, Sarah tripped on a big stone that rain had recently revealed and landed face first on hard packed earth. We limped a long for a couple weeks, with Sarah ignoring how much harder everything had gotten.....and then on 4/15 we found out that Sarah's fall on 4/1 had resulted in a concussion! So now we are limping a long for a few weeks while Mike continues to heal from shoulder surgery and Sarah tries to rest her brain and let it heal. We hate closing but have had to turn down so many requests for visits that we decided it was better to just post this so people will know. Hopefully we will be able to reopen soon since we love having visitors.....we will post here when we can reopen! 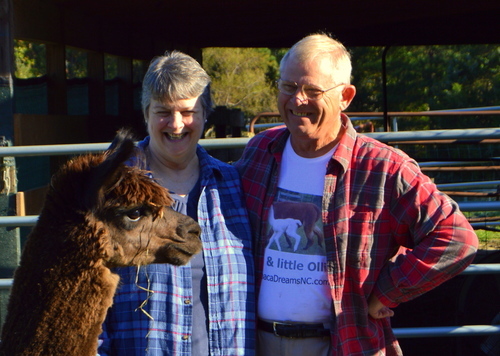 Alpacas, LLamas, and a Gift Shop.....Our Alpaca Dream come true! Please Call or Email to setup a visit. We love welcoming visitors to meet and learn about our animals. 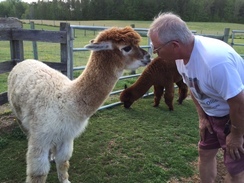 Visitors get to meet our alpacas and llamas and learn about their personalities and their unique characteristics. We have educational displays that show our crias (baby alpacas) the day they were born; interesting and unusual characteristics; the differences between alpacas and llamas; how their fiber goes from shearing to yarn; and what they look like before and after shearing. 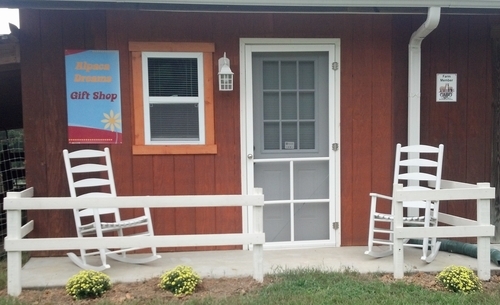 All our tours end in our gift shop so you can see things made from their wonderful fiber. Our gift shop has lots of alpaca items, some of which are handcrafted. Items made from our animals' fiber have picture(s) attached of the animal(s) whose fiber was used to make the item. Many people like to find items made from the fiber of their favorite animal. We accept cash and credit cards. We do not have regular hours but all you have to do is call (919.340.0070 - Please leave a message if we do not answer) or email us (alpacadreamsnc@gmail.com) to set up a date/time so we are sure to be home when you come to visit. You may even be able to come out the same day if we are home. We don't charge a fee but do appreciate donations (ie: $5 per person) that goes 100% toward the animals' expenses.....but we don't want that to stand in the way of anyone visiting. SPECIAL NOTE.....our animals do not do well with dogs and other 'scary' animals so we appreciate our visitors leaving their pets at home when they visit. We first learned about alpacas in early 2010 and fell in love with them...so much so that we decided the 'alpaca life' is how we want to live in our retirement. Over the next couple years we acquired our herd by purchasing 8 adults and having 2 crias born to us. During that time we were boarding all of them while we sold our house. Starting out we had no idea it would take more than a year and a half to sell our house and finally find our own farm. But by July 2012 we finally had sold our house; purchased a farm; prepared it for our herd; and brought them home. We thoroughly enjoy having visitors come out to meet our animals and learn about alpacas and llamas!